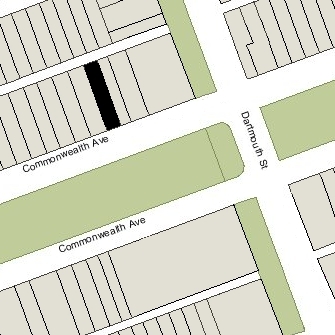 165 Commonwealth is located on the north side of Commonwealth, between Dartmouth and Exeter, with 163 Commonwealth to the east and 167 Commonwealth to the west. 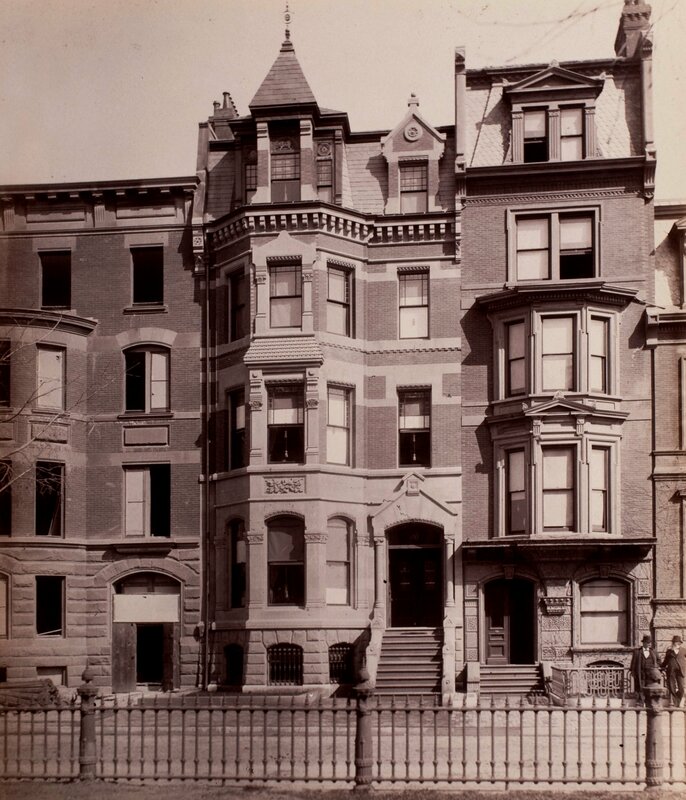 165 Commonwealth was built in 1880 by James W. Tobey, builder, for John Erskine, a shoe and boot merchant, and his wife, Catherine (Walker) Erskine. 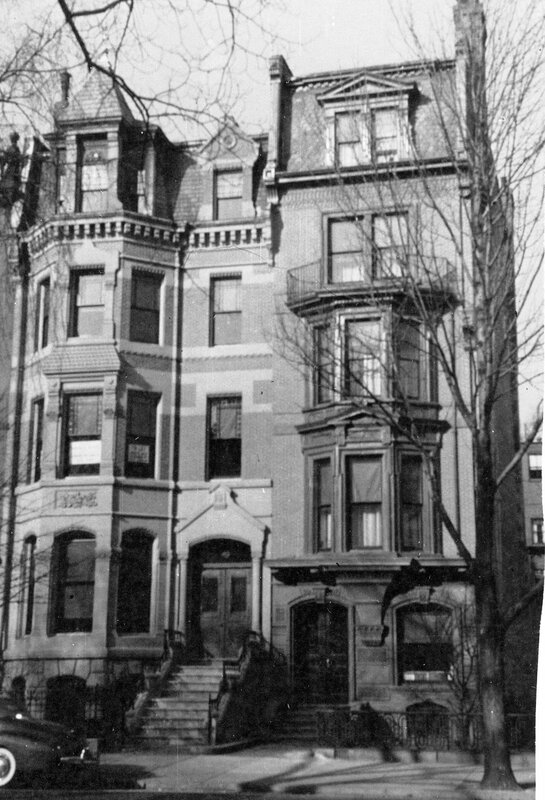 They previously lived at 125 Newbury. John Erskine is shown as the owner on the original building permit application, dated December 22, 1879. No architect is named. 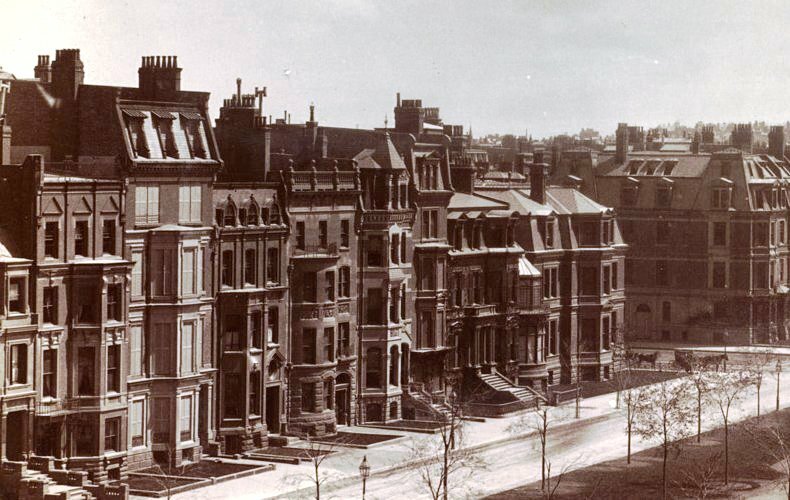 However, in his Houses of Boston’s Back Bay, Bainbridge Bunting indicates that it was designed by Cummings and Sears. The land for 165 Commonwealth was purchased from Eben Rollins Morse on December 1, 1879, by Charles Henry Masury, a bookkeeper in John Erskine’s firm. He and his wife, Evelyn (Fellows) Masury, lived in Danvers. Catherine (Walker) Erskine acquired the land from him on November 17, 1880, after the house had been built. The lot was the eastern part of a larger parcel that E. Rollins Morse had purchased on March 6, 1879; he and his wife, Marion Ronaldson (Steedman) Morse, built their home on the western part. He had purchased the land from James Sturgis and Arthur Pickering, assignees in bankruptcy of John Heard and Albert F. Heard. John Heard and Albert Heard had purchased the land from the Commonwealth of Massachusetts on May 28, 1874. Click here for an index to the deeds for 165 Commonwealth. John and Catherine Erskine lived at 165 Commonwealth during the 1880-1881 winter season, but moved soon thereafter. By the late 1880s, they were living in Plainfield, New Jersey. On June 23, 1881, 165 Commonwealth was purchased from Catherine Erskine by Vanlora Joanna (Aiken) Clapp, the wife of shoe manufacturer George Bucklin Clapp. They also maintained a home in Rockland. George Clapp died in November of 1894. Vanlora Clapp continued to live at 165 Commonwealth with their daughter, Alice Vanlora Clapp. Alice Clapp married in April of 1898 to banker and stockbroker George Wightman Vaillant. After their marriage, they lived at 165 Commonwealth with Vanlora Clapp. On August 14, 1923, Vanlora Clapp transferred 165 Commonwealth to her daughter. Vanlora Clapp died in December of 1923. The Vaillants continued to live at 165 Commonwealth and also maintained a home in Washington, Connecticut. Alice Vaillant died in January of 1940, and George Vaillant moved to Cambridge to live with their daughter, Marian W. Vaillant, who was a school principal. He died in New York City in November of 1941. 165 Commonwealth was shown as vacant in the 1941 City Directory. On February 25, 1941, 165 Commonwealth was acquired from Alice Vaillant’s estate by Helen Elizabeth (Maclary) Baader, the widow of Albert Stanley Baader, as trustee of the Holden Realty Trust. On March 4, 1941, 165 Commonwealth was acquired from Helen Baader by Mrs. Lillian (Lydia) F. (Reilly) Clinkard, the former wife of Alfred Harper Clinkard. She lived at 103 Marlborough, which was owned by Fred L. Arata, a retail liquor dealer and real estate investor. In May of 1941, Fred Arata applied for (and subsequently received) permission to convert 165 Commonwealth from a single-family dwelling into four apartments. In June of 1941, he amended the application to increase the number of apartments to five. 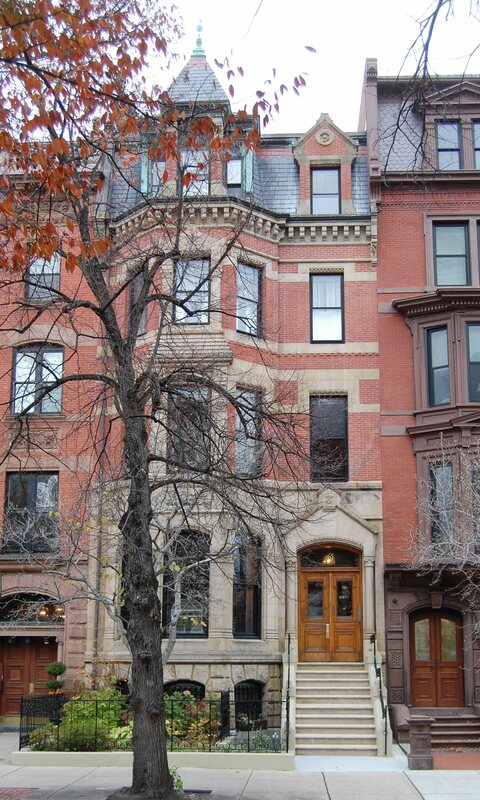 Lillian Clinkard continued to own 165 Commonwealth and to live at 103 Marlborough (which she purchased from Fred Arata in November of 1942). On October 27, 1954, 165 Commonwealth was acquired from Lillian Clinkard by Fred and Annette Arata. The property changed hands and was acquired on November 26, 1962, by Arthur E. Simons. That same month, he applied for (and subsequently received) permission to increase the number of apartments from five to eight. The property changed hands again and on March 28, 1968, was purchased by Gerassimo A. Alexandrato and his wife, Stamatoula A. Alexandrato. In November of 1974, he filed for (and subsequently received) permission to legalize the occupancy as nine (rather than eight) units, the existing condition when he purchased the house. On August 2, 1976, 165 Commonwealth was purchased from the Alexandratos by architect Patrick J. Ahearn, trustee of the 165 Commonwealth Realty Trust. In July of 1977, he filed for (and subsequently received) permission to reduce the number of units from nine to five,and on October 3, 1977, he converted the property into five condominium units, the 165 Commonwealth Condominium.